Villa La Prairie is a beautiful French home in the Var region of the South of France near St. Tropez. The villa is situated within farmland amongst the vineyards, in the quiet and calm hamlet of La Gavotte. It is approximately 2km from the small town of Cogolin and can be accessed from a lane leading off the road between La Mole and Cogolin. The location of the villa makes it very easy and convenient to access key routes to: St. Tropez; Ste. 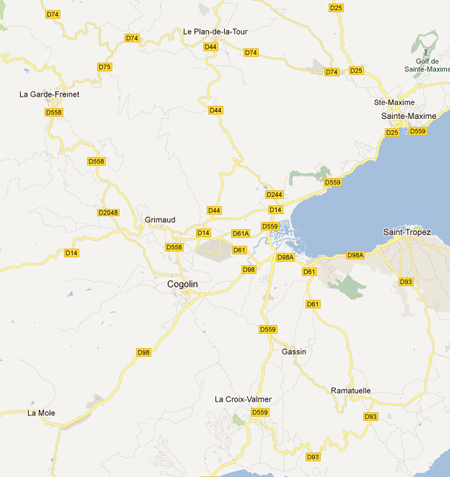 Maxime; the fabulous beaches and the surrounding small towns and villages. Map showing the route between Cogolin and La Mole on the D98 and the surrounding area.